Never leave your pets in your vehicle.Hundreds of pets die from heat exhaustion each year because they are left in parked vehicles (source: AVMA). Many pet owners don’t realize that even if they leave the windows cracked (or the air conditioner running), temperatures can still rise quickly and put pets at risk of serious illness or death. Do not walk dogs or allow them to exercise or play hard during the very hot weatheror the hottest party of the day. Exercising your dogs in the early morning or evening is recommended. Remember that hot pavement can injure your pet’s paws. Try this quick tip: Place the back of your hand on the pavement; if you can’t hold it for five seconds, it’s too hot to walk your dog. Don’t forget, your pets have delicate skin.Did you know skin cancer is the most common form of cancer in dogs and the second-most common form in cats? 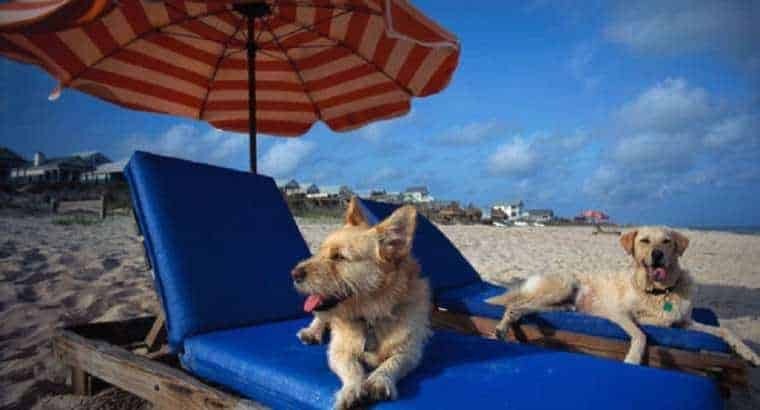 Even though fur provides some protection, you should apply sunscreen to your pet’s least hair-covered spots—dogs’ bellies and around cats’ ears and eyes. There are sunscreens made specifically for pets, as zinc oxide can be toxic for pets. If your pet does get a sunburn, applying pure aloe can help soothe irritation, but be sure to check with your veterinarian first to ensure the brand you have is safe for pets. Know the signs of heat exhaustion.Signs of heat stress could include trouble breathing, excessive panting, increased heart rate, weakness or collapsing. If you suspect your pet is suffering from heat exhaustion, contact your veterinarian immediately. Keep your pets cool indoors as well.While it’s important to not have pets outside in the heat of the day, hot weather means inside temperatures can be more difficult to regulate as well. While it may be tempting to increase the temperature in your home to save on energy costs while you are at work or away on vacation, understand high temperatures inside can be dangerous to pets also. A good rule of thumb is if it’s too warm for you, it’s also too warm for your pets. During the summer, more time is spent outside—often without the use of a leash. Unfortunately, this can lead to an increase in pets being hit by automobiles. Keep your dogs on a leash or confined by a fence—even well-behaved dogs should be kept on leash. Many cats also get hit by vehicles. Be sure to keep cats indoors, on a cat harness and leash or in a specially-designed cat fence. During warmer months, veterinarians see an increase in injured animals as a result of “High-Rise Syndrome,”which occurs when pets fall out of windows or doors. Make sure all windows are closed and have well-fitting screens. Be mindful of water safety for your pets.Never leave your dog unsupervised near an uncovered pool, and have your dog wear a bright lifejacket when boating, at the lake or beach. If you do have a pool, ensure the dog knows how to get out of the pool using the stairs by practicing with him or her several times. Don’t let cookouts and summer parties turn into bad experiences for your pets. Charcoal briquettes used for grills can get stuck in your dog’s stomach, requiring surgery. Also, don’t allow your guests to share scraps with your dog. Fatty leftovers can result in severe abdominal pain, or even death. Other foods, such as corn on the cob, also present a danger because they can become lodged in the dog’s intestines. Be aware of hazards in your garden and garage.While azaleas are common shrubs, they can be toxic for dogs or cats if ingested. Certain types of lilies can also cause acute kidney failure in cats, and even the ingestion of as little as two to three leaves can be fatal. In your garage, be mindful that any pesticides and insecticides (or plan food that include these) are out of paw’s reach. Fireworks can also be tempting for curious dogs, and the chemicals inside the fireworks could get stuck in the stomach causing serious side effects. Remove standing water from flower pots, bowls, buckets, bird baths or outdoor containers and keep your gutters cleaned so water will not be trapped. Catnip can be grown outside and lemon eucalyptus oil are natural options for a mosquito repellent.